These snow geese were victims of an event that killed about 1500 other geese. While sad, it didn’t hurt the population as a whole. If you have been reading the newspaper headlines from across the country, you know better than to venture outside in Eastern Idaho without an umbrella. Dead snow geese are falling from the sky! It started when one reporter took an off-the-cuff comment during a news interview and turned it into a headline and national sensation. While true that about 1500 dead snow geese—killed by an unknown agent—have been collected and incinerated by wildlife professionals, many of the facts were twisted or misconstrued, leaving the public wondering about just how safe they really are from wildlife disease. Disease is a natural part of any wild population of animals. I define disease fairly broadly here to include bacterial, fungal and viral infections. However, I exclude parasites and poisoning that is man-caused, such as DDT, rodenticide or even moldy grain. Poisoning is a societal choice or the result of poor judgment and is not part of this discussion. Diseases such as tularemia, epizootic hemorrhagic disease, plague, avian cholera, avian flu and botulism, are always present in the various wildlife communities. Typically, they are at low levels that cull weak and injured animals. However, there are times when an “outbreak” occurs and large numbers of otherwise healthy animals are affected by a naturally occurring disease. In recent past, epizootic hemorrhagic disease killed hundreds of white-tailed deer in North Idaho. 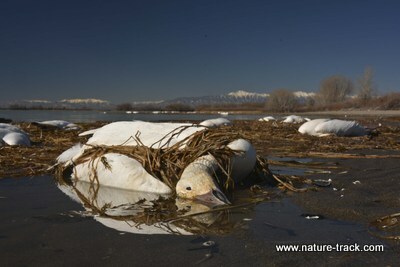 Botulism killed over 10,000 waterbirds of all kinds on American Falls Reservoir, and most recently, an undetermined killer slew the 1500 snow geese at Mud Lake, Market Lake and Camas NWR. However, none of these resulted in population level declines. There are no natural defenses against introduced or non-native pathogens and their impact on populations can be more devastating. These diseases include: white-nose syndrome in bats, West Nile Virus in birds, brucellosis (a European cattle disease) in elk and bison, and Bd chytrid fungus in amphibians. In fact, some scientists consider infection from the Bd chytrid fungus, likely started from worldwide distribution of the African clawed frog for use in human pregnancy testing, to be the worst infectious disease ever experienced by vertebrates. These outbreaks flare up when environmental conditions swirl like a perfect storm. Almost always, concentration of animals is part of the equation. In the case of the white-tailed deer, drought concentrated them at available springs where the knat that carried the disease also thrived. Some wildlife diseases can be transmitted to humans, but most are not human diseases. Humans can’t get sick from most avian flu strains or avian cholera. The trick is telling the difference between an animal sick with a transmittable disease and one that is not. The advice to NEVER handle any animal that looks sick or injured is wise indeed. It could be innocuous, but it could also be plague or rabies. There is only one solution to wildlife disease: leave wild animals sufficient habitat to stay naturally dispersed. I hope we can do that.